Sun., Oct. 29, 2017, 6:41 p.m.
TEMPE, Ariz. – Ronald Jones II ran for 216 yards and two touchdowns, Sam Darnold revved up No. 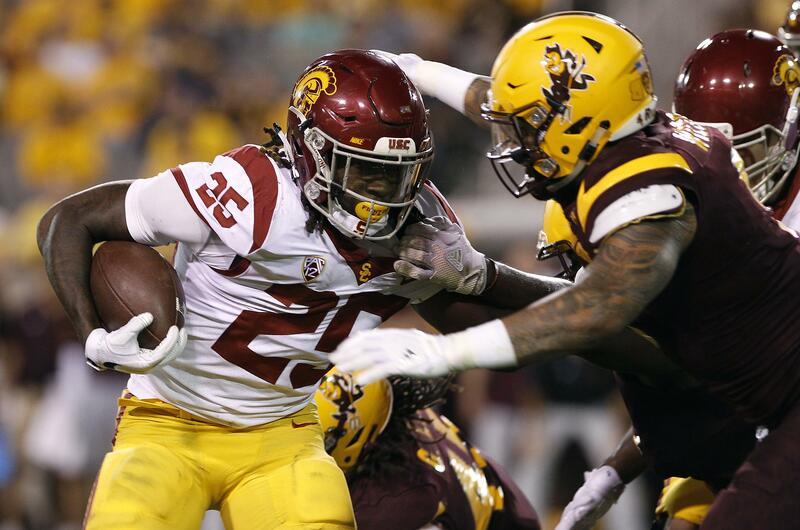 21 Southern California’s offense with three touchdown passes and the Trojans rolled to a 48-17 victory over Arizona State on Saturday night. USC (7-2, 5-1 Pac-12) rebounded after a 49-19 thumping by No. 9 Notre Dame last week by racking up 607 total yards to remain atop the Pac-12 South. Darnold completed 19 of 35 passes for 266 yards, and Tyler Vaughns had six catches for 126 yards with a pair of scores. Jones helped the Trojans pick up 341 yards rushing after they were limited to 76 yards against the Fighting Irish. Arizona State (4-4, 3-2) relapsed on defense after consecutive strong showings, missing tackles and assignments while giving up multiple big plays. The Sun Devils fell behind 31-3 before gaining some momentum on a bizarre play to end the first half but couldn’t stop the Trojans to keep it going. Manny Wilkins threw for 259 yards and accounted for two touchdowns for Arizona State. Darnold picked Arizona State apart early when he wasn’t being pressured, hitting Deonta Burnett on a 32-yard TD pass on the opening drive and Vaughns on a 42-yard catch-and-run score late in the first quarter. He later threaded a pass between three Arizona State defenders for a 19-yard touchdown pass to Vaughns that put the Trojans up 28-3. One bizarre play gave Arizona State life. Wilkins completed a Hail Mary to Kyle Williams on the final play of the first half, a play ruled short of the goal line by the officials. USC’s players trotted off the field while a few of Arizona State’s lingered as the officials went to a review. After about five minutes of review, they ruled Williams caught the ball in the end zone before falling out to the 1. Arizona State’s PAT team took the field, but had to wait as the Trojans’ special teams unit returned from the locker room. Brandon Ruiz’s extra point cut USC’s lead to 31-10, and the Sun Devils pulled within two touchdowns on Wilkins’ 1-yard dive to open the second half. Arizona State’s penchant for missing tackles gave USC the momentum back when Jones, who had a 67-yard scoring run in the first half, shed several defenders on a 64-yard run to make it 38-17. Published: Oct. 29, 2017, 6:41 p.m.